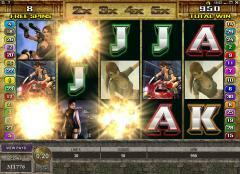 Tomb Raider is a five-reel, 30-payline video slot machine featuring lively animation and numerous bonus opportunities. 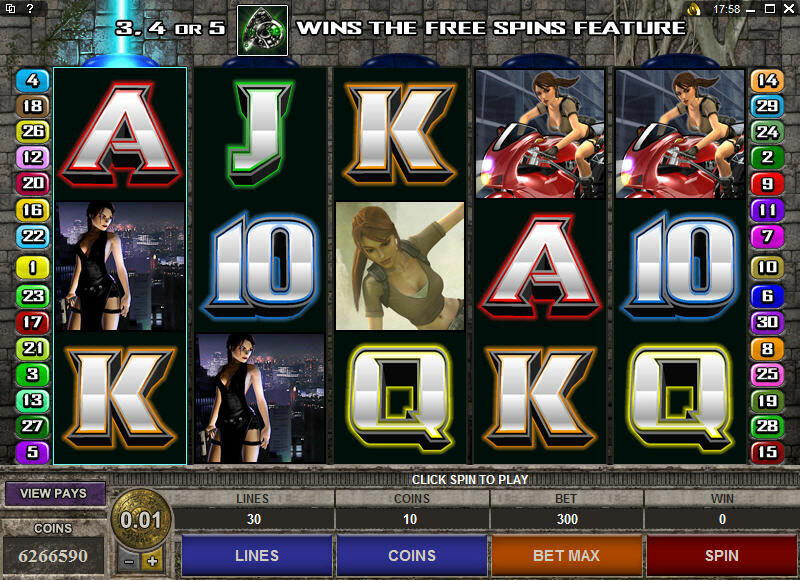 Microgaming, the reliable software manufacturer, has devised the game based on the popular "Tomb Raider" comic book and movie series. You will see icons with the main character of the series, and the game, the legendary Lara Croft. Sub-titled "Secret of the Sword," the game's objectives include finding fragments of a lost sword, which key into bonus payouts. In the process of standard play, the multiple paylines available will increase the player's chances of winning. This slot features a wild and a scatter, and bonus games that are consistent with the theme and which offer the player a chance to score big, and to have quite a bit of enjoyment in doing it. The appearances of three or more Excalibur symbols, which are scatters, get you into the Free Bonus Spins game. The Passport symbols are also a real key, as they get you to a potentially lucrative Global Adventure Bonus Game, and there are also random bonus opportunities which present wilds that are constantly active throughout play. In "Secret of the Sword," the Portrait symbols are wild, and they show Lara Croft presumably avenging evil as she fires away. You are firing away, too, when you see the wild because it is a payoff opportunity. In fact, it offers the best payoff of any icon; for instance, five on any one payline will bring 7500 coins. And the bonuses certainly don't stop there. The Excalibur symbols are the scatter, and three or more of them displayed anywhere on the reels will activate the Free Spins Bonus Game. When the player enters this game, consecutive wins continue to be rewarded all the way up to a 5x multiplier. When consecutive wins are not achieved, it goes back to a 1x multiplier. One of the great potential payoffs - and the most intriguing bonus proposition available in this Tomb Raider slot - is the Global Adventure Bonus Game. When a Passport symbol appears in the center of a reel, that reel becomes activated and stays activated. At the point in which all five reels are activated, the Global Adventure Bonus Game is launched. In this game, you, as the player, get to travel around the world in virtual fashion, to five different locations. At each of these stops there are six artifacts. Behind the artifacts are different results. The player can find a fragment of the sword, for example, but may also encounter a trap. The object of the game is to find the fragments and avoid the traps, naturally. If two traps are found, the game is over. In the event you are able to find all of the fragments, a special jackpot prize awaits you. Along the way, bonus amounts can be accumulated as well. Finding "hidden treasure" during this process also brings the opportunity to get into the Shoot-Out Bonus Game. When you find the disc symbol, it is automatically activated. You are presented with 15 disc symbols, and the challenge is to find the disc with the highest bonus value. Lara Croft "shoots" at the discs you do not pick. At the end, you get the bonus value of the disc you have selected. You can also find yourself in "Super Mode," which is not a player control but rather an opportunity that comes at random during the process of playing "Tomb Raider: Secret of the Sword." You will get five free spins of the machine, with multiple wilds that are activated and which will remain activated during the course of those five spins. This really pumps up your opportunity to win. Lara Croft has been recognized by the Guinness Book of World Records as the "most successful human video game heroine," so obviously the theme of this game is both familiar and relevant. If you enjoy the Tomb Raider series, this is a game you will find worthwhile playing. Interested in reading more detailed information about Tomb Raider Secret of the Sword? If so Click Here for more details.